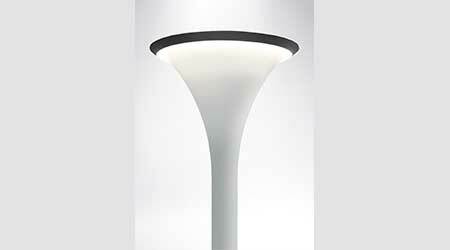 Integrating the utilitarian form factor of a post top lantern with the aesthetics of a glowing light stick, the Lunetta pedestrian-scale exterior luminaire family self-illuminates a curved funnel shaped top head as well as the pole, creating a seamless, glare-free light post of varying heights. The luminaire’s top cap is equipped with recessed high-performance LEDs aimed downward, grazing the top and pole with a gradating lighting effect. The light distribution at ground level delivers a soft, Lambertian moonlight-comparable glow, perfect for demarcating entry roadways, plazas, pedestrian paths and sidewalks. The luminaire family accommodates mounting heights from 16 inches to 24 feet. Additionally, the product is energy efficient and its associated uplight contribution is minimal.